Address: 8430 S. Old Oregon Inlet Rd. Carolina Blue Moon is a special place. It's bright & cheerful, brimming w/ vintage charm & modern conveniences. 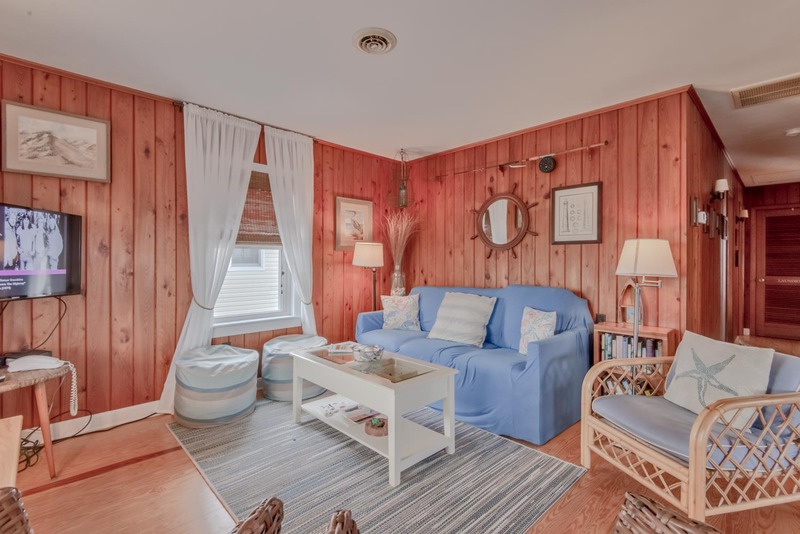 This historic 1940's salt-box style home features original Juniper board & batten wood paneling & Southern Heart Pine floors for an authentic Outer Banks beach cottage experience. Here is where you can stroll under the stars, feel the breeze, & be captivated by the southern coastal way of life. 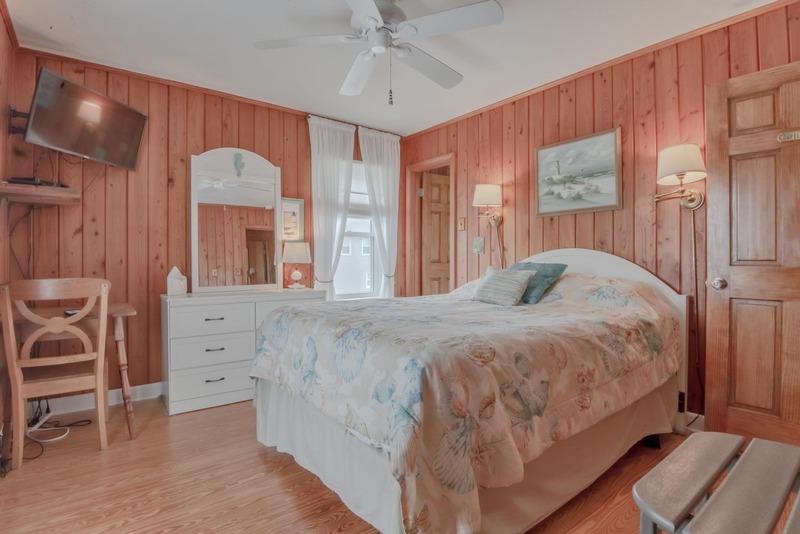 Catch the sun rising over the Atlantic from the front porch, or be adventurous & head down to the beach early (only 300 yards across the beach road at Hargrove Street). In the evening, take in the gorgeous colors of dusk at sunset over the Cape Hatteras National Seashore just out back. Bodie Island is a quiet, residential neighborhood in South Nags Head w/ wide sidewalks perfect for leisurely walks, bike riding, & jogging. It's nearby to world-famous pier fishing, bird-watching, kayak launches, surf spots, & kite flying sites. It's a place you'll remember fondly long after you've returned to the real world & one that you'll probably daydream about returning to again & again! Ground Level: Parking for 5+ Cars, Covered Area w/Picnic Table & Charcoal Grill, Steps to Entry, Hot Tub, & Enclosed Outside Shower. Main Level: Living/Dining/Kitchen Area, Flat Screen TV, 3 Bedrooms (Master Suite w/Queen, Flat Screen TV, & Full Bath, 1 w/Queen & Flat Screen TV, & 1 w/Queen, Bunk Set, & Flat Screen TV), Full Hall Bath, Laundry Area, & Covered Deck w/Furniture. Features include: C/AC & Heat, Washer/Dryer, Dishwasher, Microwave, Phone, 4 TVs, DVD, Wireless Internet, Ceiling Fans, & Baby Equipment (High Chair & Pac-n-Play). No Pets. This is a Non-Smoking Unit. Nice, clean house. The steep steps are the only reason we wouldn't stay here again. Great location; well furnished cottage. Rated Overall cleanliness and condition of home as Excellent and is very likely to return. My family of five and a friend stayed in the Carolina Blue Moon Cottage and absolutely loved it!! The decor and feel of this home cannot be beat and the wood floors throughout are beautiful and clean! The hot tub was great to have and so was the porch swing! We had a great time at the cottage!! It's quaint and personal, but also has all of the amenities you'll need!! We hope you have as much fun as we did. Enjoyed our stay. Great little home. Very cute, well cared for cottage. Great location!